It’s been a while since my last post. You feel abandoned. I get it. You’re not alone. My running shoes, my swim gear, and my Zwift setup all feel the same. It’s not that I don’t love you anymore. I still feel the same. It’s just a different feeling now. Yes, I am talking about injury, illness, work, and cold weather. The last three months have been a bit difficult. After coming back from the hip flexor injury, I decided to get back in the pool. I was out of the pool for about two months because I couldn’t really kick very well. Ok, my kick is garbage anyway, but the injury made it actually hurt just to kick a soft two-beat kick. Of course, as a coach I know about coming back from injury and taking it slow. As an athlete, though, I’m an idiot. I decided the best workout would be a 6 x 400-yard workout with paddles. I know what you’re thinking, and yeah, it was a bad idea. I tweaked my rotator cuff and couldn’t even do 1000 yards two days later. Two more months out of the water. Boom! At least I freed up some time. Basically, October through mid-December saw me working a lot of hours, which is not abnormal, but I don’t control my schedule right now. Basically, work kept me limited to one workout per day plus my 15K commute on my bike. But, it gets worse! What is this white crap falling from the sky? It’s been a while since I lived north of Miami. I’m talking a decade of living in tropical weather. Let me tell you, a man changes under those circumstances. It does something to you. Apparently, my body now rejects temperatures below 50 degrees F as unlivable conditions. Seriously. I used to run in shorts and a t-shirt down to the mid-30s with maybe a hat and gloves. Now, I need that for 50. Then, one day this white stuff started falling from the sky. It accumulated on the ground and turned into this slushy, icy stuff. The inhumanity of the scene made me think that the world was about to end. It turns out that the white stuff is just snow and happens a couple of times per year. I still don’t get it, but I chose not to pursue the discussion further. That, and despite my moral objection to the cold, it won’t go away for a couple more months. So sad. Time to get all swole. Do you even lift, bro? 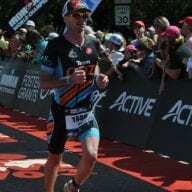 Since I had some downtime due to injury, I decided to put some time into working on developing some strength and power that I hope will eventually transfer to faster swim, bike, and run times. Fortunately, I have a bit of experience in strength training, having done it off and on for the past 20 years, and I found a great resource at work. 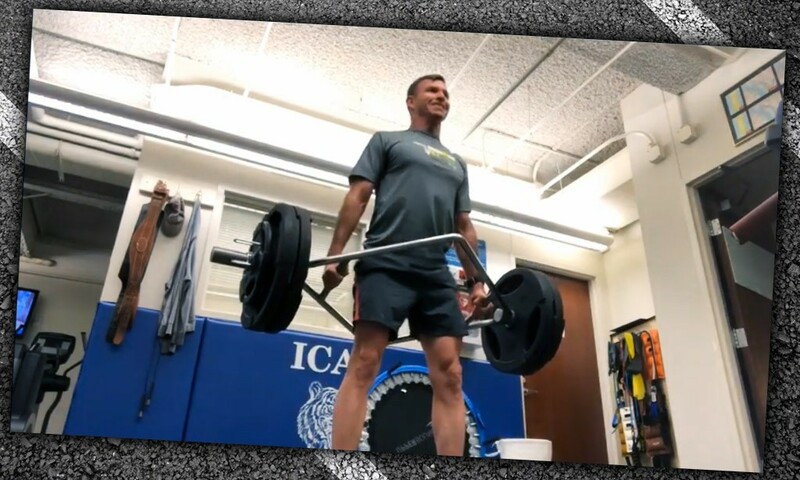 A friend of mine was the strength coach for the Washington Redskins for about ten years, so he offered to help me build an 8-week program with three strength sessions per week. I also suckered a few of my TeamODZ teammates and a few folks at the Endurance Lab to serve as guinea pigs to test out the program. Did I say suckered? I meant offered them the opportunity to try out the program. The program has a lot of exercises aimed at building raw, explosive power and strength. That means lots of squats, deadlifts, power cleans/high-pulls, weighted pull-ups, and press exercises. The first two weeks had most of us walking around a little funny, as we’re not used to lifting heavy weights. It’s also important to put “heavy” in context. Let’s face it. Most of us cyclists aren’t known for throwing around big stacks of weights, especially for upper body exercises. After mastering the form for the more technique-based exercises (again, loose use of the term mastering), I started seeing some huge improvements. At the mid-point testing, I was already able to deadlift over 300 pounds and high-pull 185 pounds. I know, it’s not a ton, but I’ll take it for a 140-pound guy. Now that we’ve closed out the year, it’s time to get back to work at my triathlon-specific training. I don’t know my schedule after the month of June, so it’s a bit difficult to plan my season. I do know that I will be moving sometime between late July and mid-September. I won’t be able to race after that for the rest of the year, so I’ll have to get in as much as I can in the first part of the year. I have set some pretty tough goals for myself, including some times I want to achieve for a 10K off of the bike and a 1500-meter swim. So, we’ll see how that goes. Well, that’s it for now. I’m on my way home from holiday travels, so expect to see more of me on Zwift in the coming months. I’ll probably jump in the occasional race, but I will be doing a bunch of workouts. I’m glad to be getting back into focused training, and I’m really glad my Zwift compatriots have been there over the last few months to keep me motivated to get in what I could. Until next time, Ride On! Very difficult, self-centered, article to read showing little overall value. While I hope you do well in your pursuits….I will no longer be reading your reports.